Our survey showed that Canadian eBusiness are emphasizing similar strategic priorities to grow their eBusinesses as their global counterparts. Indeed, two of these priorities – Web and Customer Analytics and Customer Experience Management (CEM) – offer substantial opportunity to raise their competitive level. Unfortunately, the skills required to execute on these goals may not be widely available in Canada at this time. 71% of respondents are focusing on Web and Customer Analytics to grow their eBusiness. This makes sense, as Analytics (and Big Data) have become the new “big buzz”. However, there are two concerns. First, too much of the current focus is on web analytics (“How many hits did our website get?”) and not on the broader base of data available to online/ offline businesses. Second, from our experience however, few Canadian companies have the skills and experience to take advantage of the analytics opportunity, both at the management and staff levels. To address this skills shortage, educational Institutions like the Queens School of Business are taking the lead by offering a Masters of Management Analytics graduate program. For staff professionals, the University of Toronto School of Continuing Studies is offering courses in Business Analysis and Business Intelligence, and heavily integrating data analytics into their eBusiness/ eCommerce Management certificate program. As well, 61% of respondents indicate that they will focus on Customer Experience Management to grow their eBusiness. This approach can be very transformative, generating many high value opportunities to improve the customer experience. 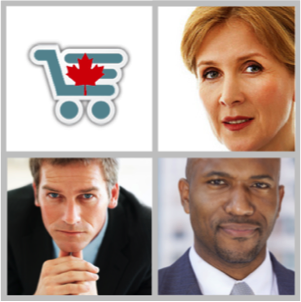 Yet from our experience, many Canadian eBusinesses are “process-centric”, rather than “customer-centric”. Tools such as customer experience mapping are rarely used in Canada. And in most eBusinesses, no single group or individual owns and manages the complete online/offline customer experience.